We're seeing a second Bravo that's also on W Hillsborough Ave in Tampa, but is completely different from the first. It still had a few problems, but overall it was much better. This Bravo is located to the right (east). The entrance used to be to the right of the palm tree, but is now under the word "supermarkets". 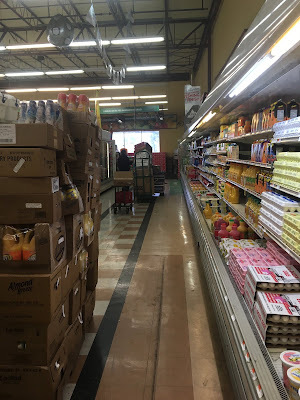 It looks like a few grocery aisles have been taken out, moving the produce department into previously grocery space but keeping the deli/bakery where it was. You now enter next to customer service to the right. Very spacious produce department. Probably more spacious than it used to be, since it takes up more space than it used to. Hot food/deli and bakery are all in nice shape, unlike the other Bravo, and the store does have a nice café just to the right here. There's still plenty of empty space here, though, and the seafood department is closed up. I didn't go closer because a manager started looking at me suspiciously. The parts of the store that have not been closed off are still very nice. The produce selection here was larger as well. Meats line the back wall. There is also a full service butcher. This store, as you can tell, is larger than the other Bravo and generally in nicer condition, although the floor could be refinished. This store is significantly larger also than the C-Town in Perth Amboy, it's possible the owners are having a hard time filling the entire space. However, the dry goods department is very well-stocked. It seemed to me this store was much more NY/NJ-style, with a wider selection of general goods as well as a large ethnic selection. The Bravo 7733 was a much more specialized selection, with fewer mainstream groceries. This decor package has also been used in the New Jersey area. Come on. Do we get either nice signs or accurate signs? Can't there be a middle ground somewhere? Dairy and frozen, both of which are generally well-stocked, line the last aisle. 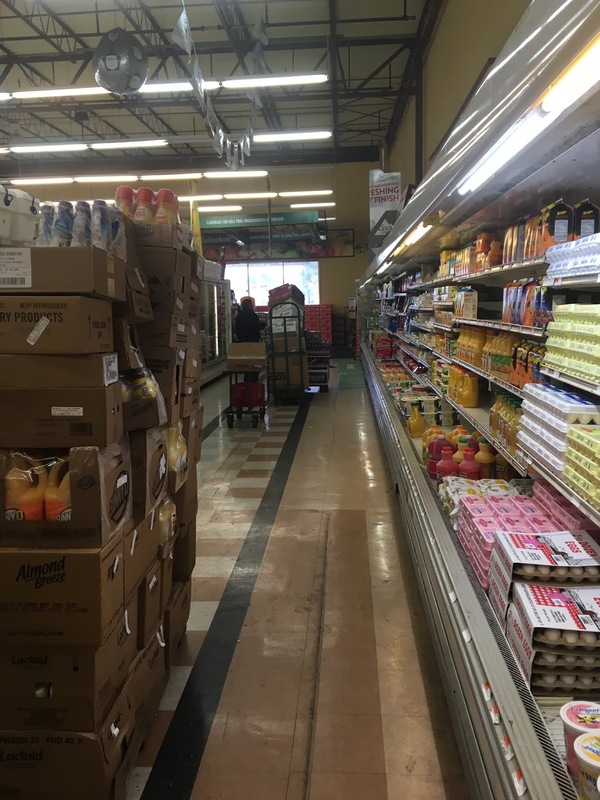 Here's a look along the front-end towards the produce/deli area. The front corner here is similarly random, with some liquor mixed with large packages of sale items. There's a little too much space in this store in general, so like with the other Bravo, they'd probably do well to actually subdivide the space and bring another tenant in. Or, as some stores do, lease space within the supermarket to other businesses -- pharmacy, electronics stores, etc. A look across the front-end from the produce side. I really like the large checkout number signs hanging, and this store's high ceilings allow signs like that to work. "Bravo a tu Lado" (Bravo on your side) is generally a Florida slogan, with the NY-area stores using "Every aisle leads home" or more recently, "Find your Flavor". Looking back into the store from the combined entrance/exit. This store was much nicer and much better taken care of, but still too large. The space should be subdivided where the customer service counter ends here, even if they keep all the service departments and just move them. (Or the same size on the other side of the store.) Obviously, that would be costly, though. Why does this particular Bravo give me a Pathmark vibe? Good question! The decor isn't really like anything Pathmark has ever done, and Pathmark (except in some Sav-A-Center stores) didn't really have stores with exposed ceilings like this. Something about the layout, maybe?